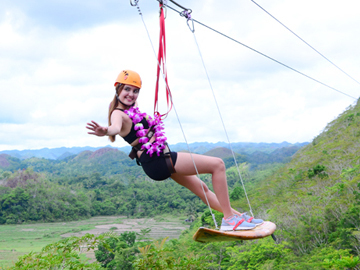 The first and only surfing zipline in Asia and maybe in the world. Enjoy surfing over the hills on a surfboard. Imagine yourself hovering 230 ft high, in Hawaiian shirt and lei as you weave through the hills and view the magnificent Chocolate Hills just as if you were surfing the waves in Maui. 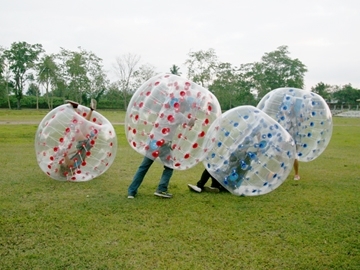 An exciting addition to the CHAP experience, Choco Zorb Ball is perfect for guests who want adrenaline-pumping activities. Adventurers are safely strapped inside a big "beach ball"-like orb and are rolled downhill a 100-meter slope. 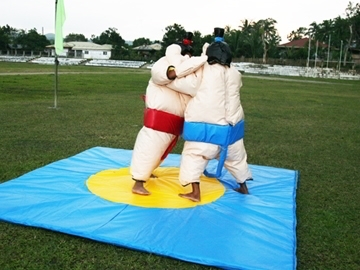 The zorb is made of two separate thick, strong and flexible plastic layers with at least 2 feet of air in between that absorbs the shock for the riders as they tumble down a chocolate hill. Get close and personal with the Chocolate Hills. Take the challenging but exciting trail as you explore its hidden secrets. See how God's creation offer livelihood to the people of Carmen. See the rich flora and fauna as you explore the inner secrets of Chocolate Hills.